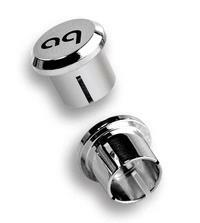 AudioQuest - Noise-Stopper Caps / set of 10 ea. Extraneous and unwanted RF/EMI signal abounds. (Think cell phones, computers, microwave ovens and the like.) The AQ Noise-Stopper Caps are grounding plugs (not shorting plugs) that help you block out this unwanted noise by occupying all of your open inputs on the back of your components. All that and they look cool, too.